Inside circles is another of those moves that is in essence very simple. However I've found that people find it quite difficult and it takes practice to make it smooth. It's essential to have solid inside circles before moving onto step ins and step outs. 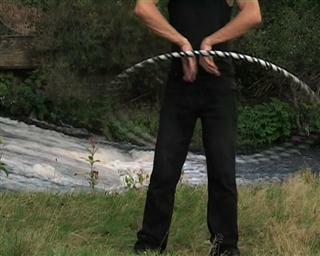 We previously looked at outside circles which involves passing the hoop around your body. Inside circles is similar but you are inside the hoop. There are a few things that can be helpful to know when practising this move but first take a look. This move is very fast and this is the problem. The pass behind the back is the same as in the the lift out back pass and it's a good place to go into the this move from. Usually when we make an exchange we have a little time to recover and iron out any errors. So any error on the exchange and the hoop falters, this causes the next exchange to stall and we lose momentum. You can see that the front exchange is not gripped but carried in the crook of the wrist and that's not something we've looked before. So... things to keep in mind when doing this move. Keep your hands very close to your body. There is a similar move where the arms are away from the body but this isn't it. 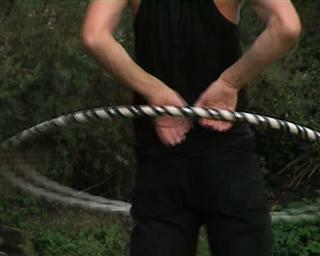 In order to give yourself more time, turn with the hoop. Turning with the hoop will always help you learn moves where you feel there isn't enough time. The only problem is that you have the complication of having to think about turning as well. Some people find this easier when worked around the knees, if that helps then do it but remember to move back up when you have control. Once you have this move under control you're ready to try stepping in and out of the hoop.